In the last part of this series we’ll look at mak­ing cir­cles and cylin­ders. They are a lot trick­i­er than it seems! We’ll be build­ing on every­thing from the pre­vi­ous parts, as well as doing some Bmesh to fix nor­mals.
""" 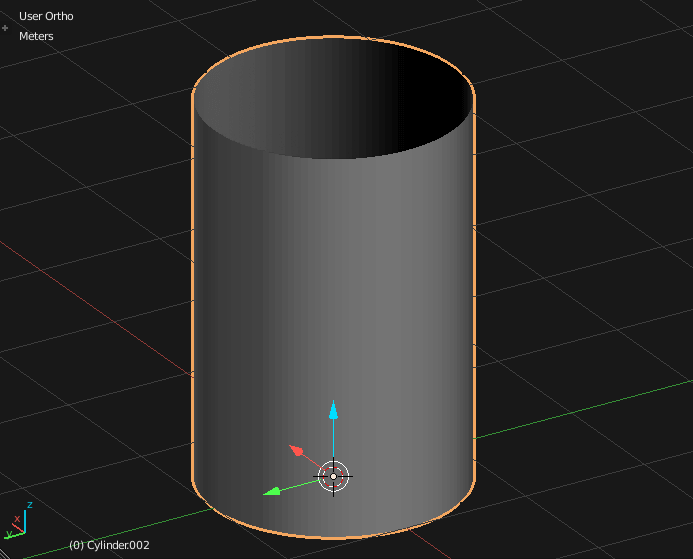 Enable smooth shading on an mesh object """
""" Create a mesh object and link it to a scene """
The first step to mak­ing a cylin­der is mak­ing a 2D cir­cle. First, we need to put ver­tices in a cir­cle around a point. We’ll cal­cu­late the the angle at which each ver­tex is. This angle is actu­al­ly a polar coor­di­nate, so to get X, Y coor­di­nates we can use we’ll also to con­vert it to Carte­sian. You can read more about the math on mathisfun.com and on Wikipedia Of course we are pass­ing the val­ue of Z, so we don’t need to cal­cu­late that. For the ini­tial cir­cle Z will be zero.
""" Return a ring of vertices """
We can use this right away to make a cir­cle but it would only be a cir­cle of ver­tices. Let’s also add edges too. 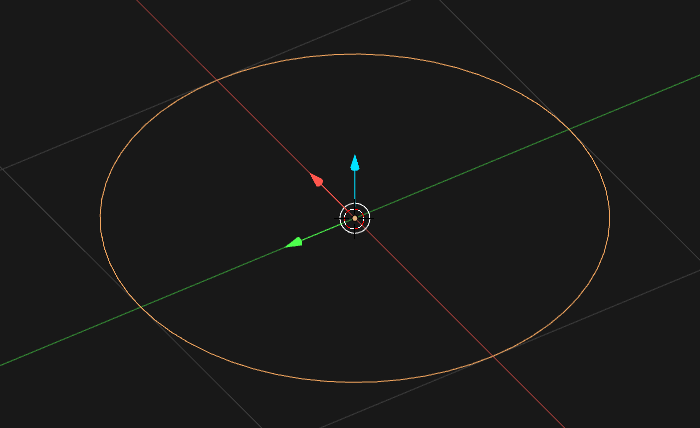 Adding edges to a cir­cle is pret­ty sim­ple. Just loop around each ver­tex and con­nect the cur­rent index plus the next one, then add the final edge which con­nects the last index with the first (zero). Fol­low­ing the lessons of part 4, let’s make a func­tion to make cir­cles.
""" Make a circle """
It doesn’t seem like much, but it’s a sol­id first step. What is a cylin­der if not a cir­cle extrud­ed in 3D space? 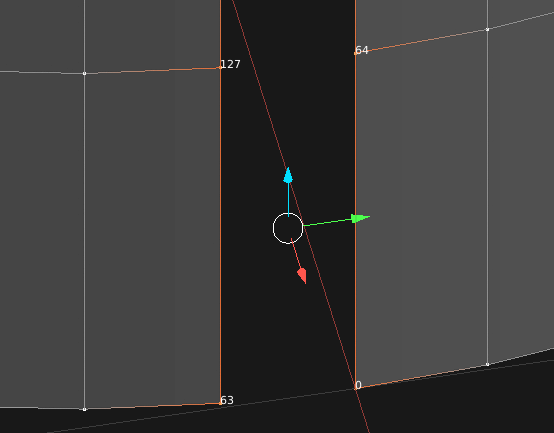 To extrude the cir­cle in the Z axis we can loop through vertex_circle() giv­ing it increas­ing val­ues of Z.
""" 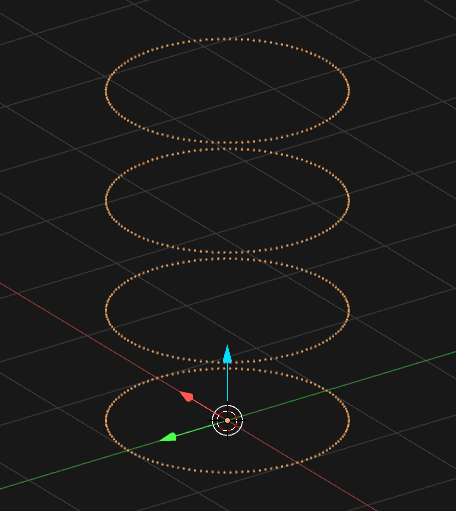 Make a cylinder """
Notice vertex_circle() returns a list of ver­tices, so we need to use expand instead of append to keep the same list struc­ture. Also, we’re not adding edges here. We will flesh­ing out this mesh with actu­al faces, so there’s no need for edges. 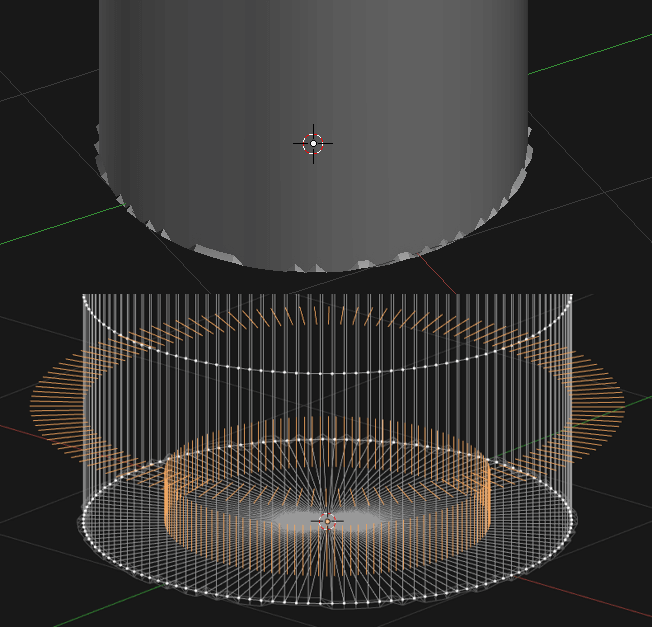 Mak­ing faces fol­lows the log­ic from the grids in part 1. Except this time, it goes around in a ring.
""" Return a face on a cylinder """
Just like in grids, the best way to fig­ure out is to turn on debug­ging and inspect­ing ver­tex indices. After all, this func­tion only needs to return the right num­bers. To make all faces across all rings and rows, we need to loop through both. You might notice we are miss­ing the last face in each ring. The last face is a spe­cial case because the indices “rewind”. We need to add a spe­cial case for that last face with a dif­fer­ent for­mu­la. On one side we need to grab ver­tices near the end of both rings, on the oth­er we need to grab the begin­ning verts. It’s sim­i­lar to the last edge in the cir­cle. Now we have one good look­ing cylin­der. We’re just miss­ing caps to com­plete the mesh. Ngons. All ver­tices in the ring con­nect­ed as a sin­gle face. A tri­an­gle fan. A series of tri­an­gles con­nect­ing to a cen­tral ver­tex. To make a tri­an­gle fan we need to put a ver­tex in the mid­dle of the ring, and then go loop the ring con­nect­ing ver­tices to it. On the oth­er hand, to make an Ngon only we just loop through the ver­tices’ indices and put them all in a sin­gle tuple. This is clear­er to see in the bot­tom cap code.
""" Build bottom caps as triangle fans """
In the case of a tri­an­gles fan we also need to fill the last face sep­a­rate­ly. The code for top_cap() is sim­i­lar, but we have to off­set the num­ber of indices to get the indices in the top row.
""" Build top caps as triangle fans """
Now we can call them in the cylin­der func­tion. Since we already pass­ing the cap type, we can make it a para­me­ter in make_cylinder() and let the caller pass None to dis­able caps. A cylin­der is an extrud­ed cir­cle, remem­ber? There­fore the bot­tom ring is the same as the first cir­cle we made and we can now use the bottom_cap() func­tion to fill it. Note that if we make faces for the cir­cle, we don’t need to set­up edges. Now that we have com­plet­ed the mesh, let’s pol­ish it. We can add a call to set_smooth() to enable it smooth shad­ing for it. We can also add some mod­i­fiers like we did in the last part. We’ll add some bev­el and an edge split to fix the shad­ing. We only want to add a bev­el mod­i­fi­er if we actu­al­ly have caps though. If you try this you will find there’s some­thing wrong with the bot­tom cap. The bev­el mod­i­fi­er is mak­ing it look real­ly weird and dent­ed. This is usu­al­ly a sign of messed up nor­mals. Jump into edit mode and enable nor­mals from the Dis­play pan­el. As you can see, the nor­mals of the bot­tom cap are point­ing up, when they should actu­al­ly be point­ing down. We need to fix that to get a good bev­el. You can do that by going into edit mode, and press­ing CTRL+N. But there’s also a way to it in code. In order to fix the nor­mals we’ll use one of bmesh oper­a­tors. These are dif­fer­ent from the reg­u­lar Blender oper­a­tors as they don’t depend on con­text. They will work as long as you give them a valid bmesh object. Bmesh is a spe­cial Blender API that gives you very close access to the inter­nal mesh edit­ing API. It’s quite faster than oth­er meth­ods and more flex­i­ble. How­ev­er, when it comes to cre­at­ing mesh­es from scratch Bmesh doesn’t offer any­thing too dif­fer­ent from the oth­er way. That’s why this series hasn’t touched on Bmesh until this point. In order to use bmesh we first cre­ate an bmesh object, then fill it with data (in this case using from_mesh()). Once we are fin­ished with it, we write the new data to the mesh and free the bmesh object from mem­o­ry. I won’t get too deep in Bmesh now since that would take an entire sep­a­rate tuto­r­i­al. You can read more about Bmesh in the docs. For now, let’s make a func­tion that takes a mesh and fix­es it’s nor­mals.
""" 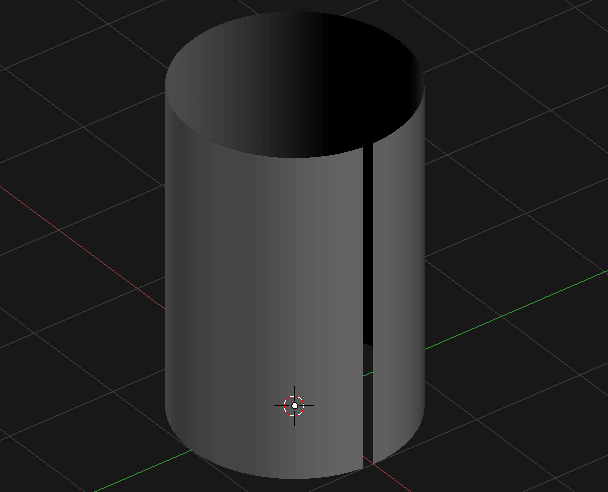 Make normals consistent for mesh """
Adding a call to this func­tion in make_cylinder() yields the final, awe­some look­ing cylin­der. That’s it for this tuto­r­i­al, and the whole series! I hope these tuto­ri­als have been use­ful for you, or at least learned a new trick or two. We have talked about mak­ing 2D grids, cubes, icos­pheres, cir­cles and cylin­ders. We’ve also gone into debug­ging, man­ag­ing com­plex­i­ty, set­ting smooth shad­ing, adding and apply­ing mod­i­fiers, recal­cu­lat­ing nor­mals and read­ing data from files. It’s quite a lot, but it’s only the begin­ning. 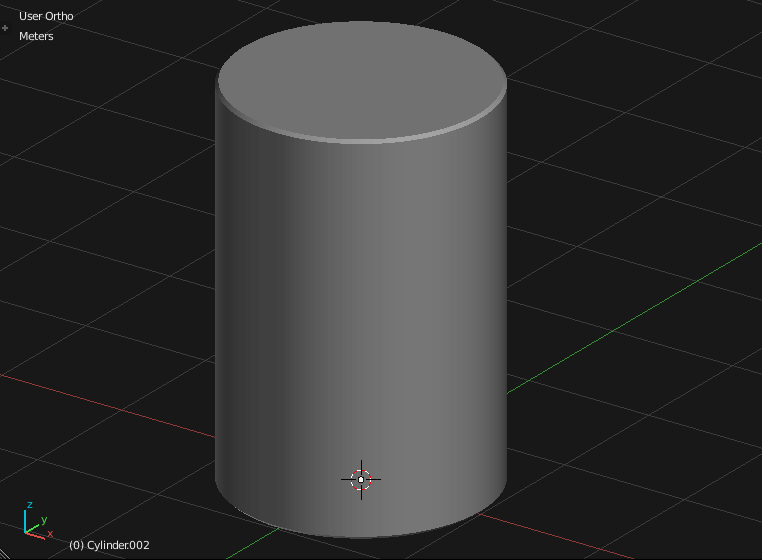 There are plen­ty more things to explore and learn in Blender! Refac­tor the cap func­tions into a sin­gle one, that can make both caps, one or none. Got any ques­tions, or sug­ges­tions for new tuto­ri­als? Leave a com­ment below!